The Emergency light iis built in with a rechargable Lithium Ion battery of 1300 mAh. The Battery has more than 500 times charging and discharging recycle life. 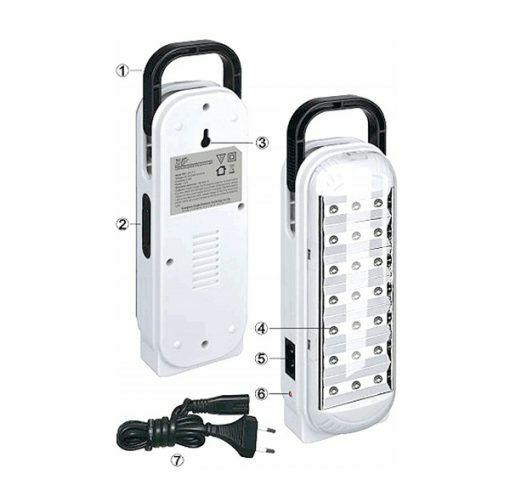 Rechargeable Technology Parametric: Ac input Voltage:90 240V 50/60 HZ,Charging,Current:0.15A 1.2W. Dimension 20.8 cm x 6.8 cm x 5.4 cm It contains a chain of 20 LED with milky white light and emit a highly focused powerful battery.